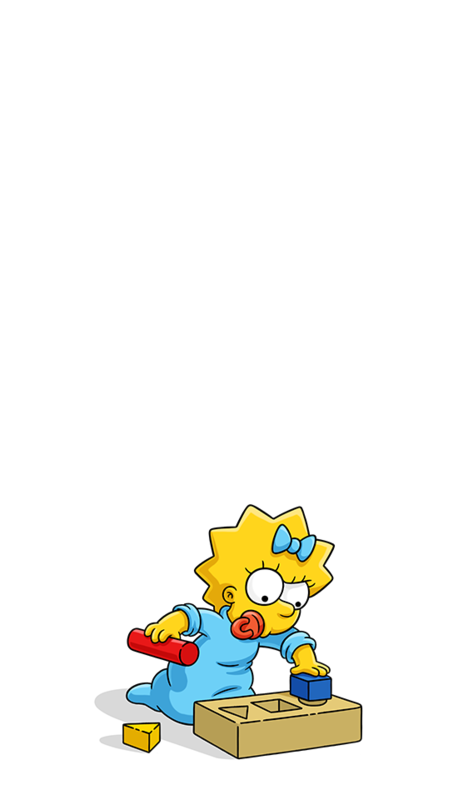 Youngest of the Simpson clan. She crawls about falling and sucking on her pacifier. Understands everything. She was responsible for shooting Mr. Burns after he took her sucker from her. Says: sucking noises. Well, once she said 'Daddy' but that was it. Saved Homer at least five times. Once from a drowning, once by catching a beer bottle flying at his head, once from being shot by mobsters, once from being kidnapped by a tow truck driver, and once from being beaten up by a toddler. Homer ends up on the wrong end of a nail gun when baby proofing the house. Marge is worried about how the kids are all acting like teenagers. Crows take Maggie out of her room and fly her around town. Moe saves Maggie's life while trying to commit suicide. Maggie gets stuck in a newspaper machine on the street.